Here's another review that I finished a while ago and just left sitting here without publishing it. :P Sorry again. 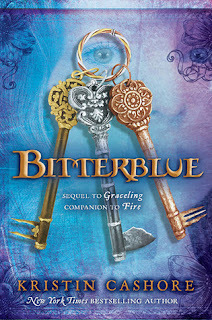 Before you read this book, please read Graceling and Fire. It really helps! If you don't, you might be really confused but you might not. I really loved Bitterblue. Kristin Cashore is an amazing author. The new world in the Graceling series is incredibly interesting. I like how Bitterblue includes every single realm. It's also nice that Bitterblue links all the characters from Graceling and Fire together in one book. It's an excellent ending. Though I do hope there will be more to the series, but if not then I am satisfied with the ending. Though that ﻿could﻿ be improved a bit. She could answer a few questions that the reader is left with by including an epilogue or something. Though these questions aren't ﻿that﻿ important and ﻿could﻿ be left to the reader's mind. I'm glad that Bitterblue has everyone that she has, because if she didn't she'd probably fall apart. That'd be awful. I don't think I'd like that very much. It sure would be a great story, but poor girl. Everyone will just think she's exactly like her father! Both of them wrecks. One evil, the other kindhearted. She's quite brave as well. Though she honestly didn't have to sneak around so much. Poor Saf. His heart was broken. I truly wonder what will happen of him... The ending didn't really tell us about that. Oh I know! Kristin should write a story about Saf! He's such an interesting character. There has to be some story she could write about him! There just has to be! I would love that. Now I'm excited over a book that probably hasn't even been thought of yet by the author. I'm sure there's fanfic somewhere out there about him. There just has to be. Katsa and Po are amazing. I'm glad they were able to be in this book as well as Fire. She's such an interesting character. I think she might be my favorite actually. I'm not sure. It's so hard to decide! To me, this book deserves a 5/5 rating! So there you go! What makes this book different from all others? And why should anyone care? For starters it's in a brand new world. There's a whole new species! Come on! It's just different! People should care because it's unique (in my opinion) and just so much fun! Did this book meet my high expectations? Yes. It definitely did. Would I recommend this book and to who? I would recommend it to all who enjoy YA fiction.